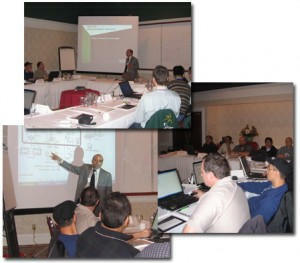 Zensol is not only a manufacturer of test instruments, but also organizes on a regular basis technical seminars covering various aspects of substation Maintenance. On demand / on schedule. Given by highly trained specialists, with more than 20 years experience. Maintenance seminar: A complete understanding of the importance of planning and structuring Maintenance for high-voltage circuit breakers, based on standards and instruments, validated and approved respecting those standards. Circuit breaker testing: Everything about the CBA and its associated accessories, timing and motion measurements, the CBA-WIN software, standards. Recloser testing: Everything about reclosers, the GEN series, the measurement methods, the GEN-WIN software. Vibro-acoustic tap changers testing: A complete and detailed understanding of the whole mechanism: from the measurement until the interpretation of the results. CBA-WIN calculus: An approach of the calculus files, programming methods to mathematically analyze recorded signals, the Mayn calculus functions, how to customize your own calculus files. We can work on customized seminars and real tests demonstration to answer special needs.